Yellow-breasted fruit dove Ptilinopus occipitalis, photographed by Talalak. 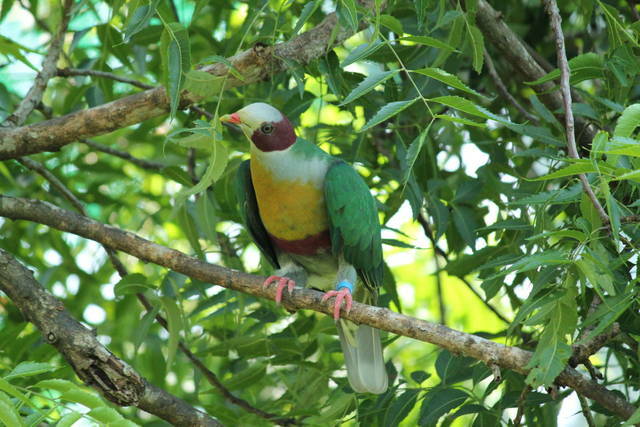 Ptilinopus includes the fruit doves, an assemblage of generally compact, short-tailed, brightly coloured doves found in southeast Asia and Australasia. Fruit doves are diverse in appearance, and some authors have divided them between separate genera. Phylogenetic analysis also suggests that the cloven-feathered dove Drepanoptila holosericea of New Caledonia and the blue pigeons Alectroenas of Madagascar and the Mascarenes are nested within Ptilinopus in the broad sense. [FR98] Fritts, T. H., & G. H. Rodda. 1998. The role of introduced species in the degradation of island ecosystems: a case history of Guam. Annual Review of Ecology and Systematics 29: 113-140.